We were checking out the Christmas clearance sales at Target over a week ago when I noticed they already had their Valentine's Day stuff out. And the theme is OWLS! Can you believe it?! nice! and pink owls...they are so cute! Annegret - right?! Sometimes I think people are watching me! FeR - pink owls are so hard to find in their natural habitat! I have an old Starbucks owl that I have named Mohamed Owlie. Get it get it? LOL. Yeah I'm pretty much the only one that finds it funny. 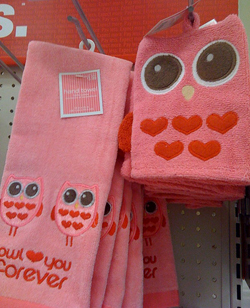 Is it weird that I saw these a while ago and my first instinct was "hmmm..owls..I wonder if Jenny has seen these yet?" You definitely have your finger on the pulse of trends! Impressive. omg...I WAS THERE YESTERDAY AND DIDNT SEE THEM!! How in the world did i miss them??? 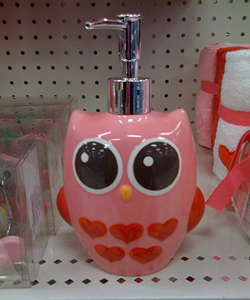 And I thought my pink soap pump was cute! OMG! I hate that we don't have Target up here! i saw these endcaps up BEFORE christmas in my target! amazing. and last week i saw st. patty's day tees.